Scopri le storie dietro alcuni degli oggetti che Venezia è famosa per includere intricate maschere di carnevale, vetro soffiato, velluto, broccato e carta di marmo. In questo tour privato e personalizzato, scopri la storia di queste industrie e come ancora oggi influenzano l'industria commerciale di Venezia. Avventurati nei percorsi turistici e negli studi e negozi di artigiani locali. Our guide went the extra mile to make this an interesting tour but it was a little bit of a disappointment. 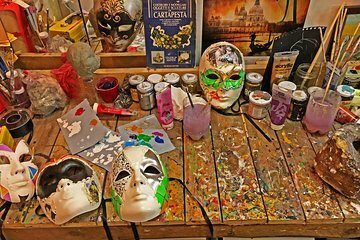 We started in a very small mask store where the owner pointed out a few masks and then seemed to want us out of the way so he could squeeze in some customers who would pay to paint masks. Next was a glass blowing demonstration and a walk through the showrooms. This was the highlight of the morning, even though we saw something similar at a factory in Murano. At this point we were done with the official agenda and completely underwhelmed, but our guide whipped us into a small lace shop and then walked us across town to a perfume shop. Despite the best efforts of our guide, I can't recommend this tour, the content was disappointing.